Have you seen the new Febreeze commercial? A woman walks into a laundromat and to the confusion of the laundry attendants has brought in her mattress in hopes of having it cleaned. It's a funny commercial that echoes the feelings of many when dealing with heavy furniture that has a tendency to get dirty. It often seems that mattresses, couches, chairs and carpets are the constant victims of stains and smells as a result of their constant use. Check the warranty, if it's still in effect check with the company on how to clean it just in case cleaners void the warranty. 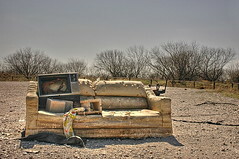 Start by vacuuming your sofa to remove any excess dirt and dust. Spot clean with a mixture of half water and half vinegar. After determining the fabric of your sofa, use a store bought cleaner for that fabric. Use similar methods to take care of the upholstery on your chairs. Use the upholstery attachment on your vacuum to remove any dirt and dust on the mattress. Create a part water part laundry detergent mix to clean visible stains on the mattress. Use a sponge and the mixture to clean stains and the fabric of the mattress. Vacuum any residue and allow the fabric to air dry. For items in your home that can be carted off to the cleaners, don't worry about making the trip, Mark Pressed4Time can come to you. Mark Pressed4Time offers pick-up and delivery for your dry cleaning. Mark Pressed4Time also offers affordable and competitive pricing on dry cleaning, shoe repair, laundry and alterations. Contact Mark Pressed4Time to make life dry cleaning, alterations, laundry and shoe repair fit into your busy schedule. Learn more about ways to protect and preserve items in your home through the Mark Pressed4Time blog.